When I look back on my years of home ownership and apartment renting, I realize that there is one decorating staple that’s remained consistent in my life. Flowers. Pink, purple, yellow … it doesn’t matter what color. 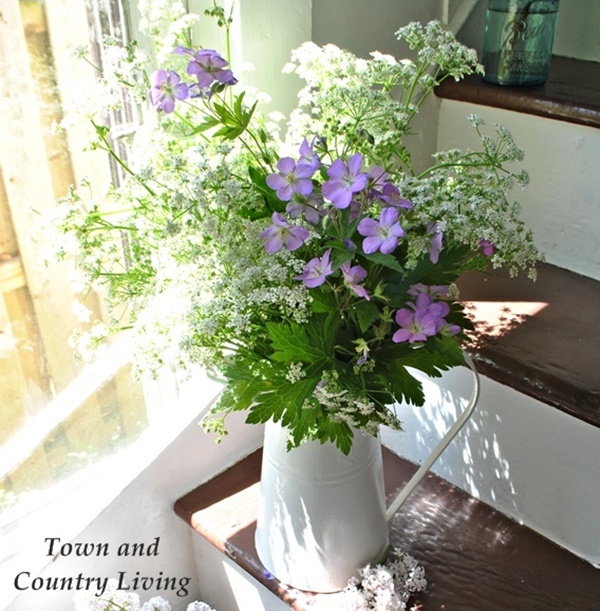 Having flower arrangements in the home is a sure way to perk up a room and lift the spirits. 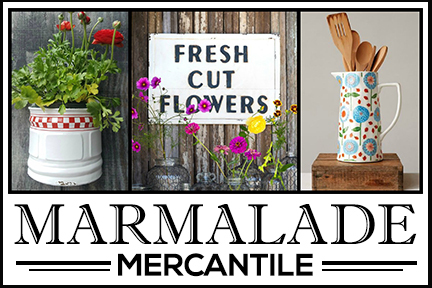 Today I’m sharing 10 of my favorite arrangements with you! My absolute, all-time favorite bouquets are created from flowers in the garden. There’s something so gratifying about stepping outside to gather a beautiful bouquet of garden flowers. 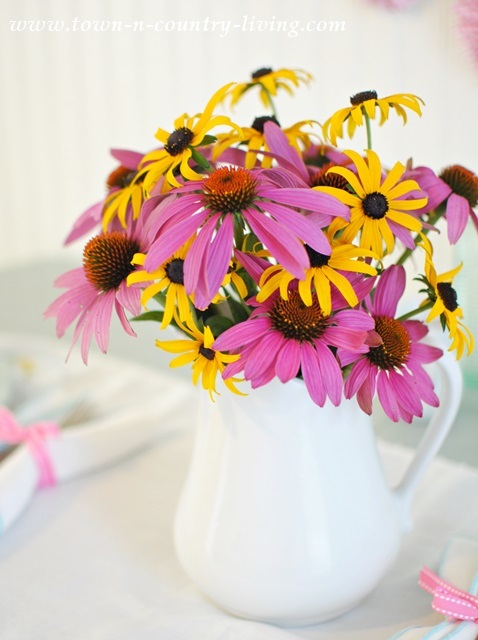 This country style arrangement consists of Cone Flowers and Black Eyed Susans tucked inside a favorite ironstone pitcher. 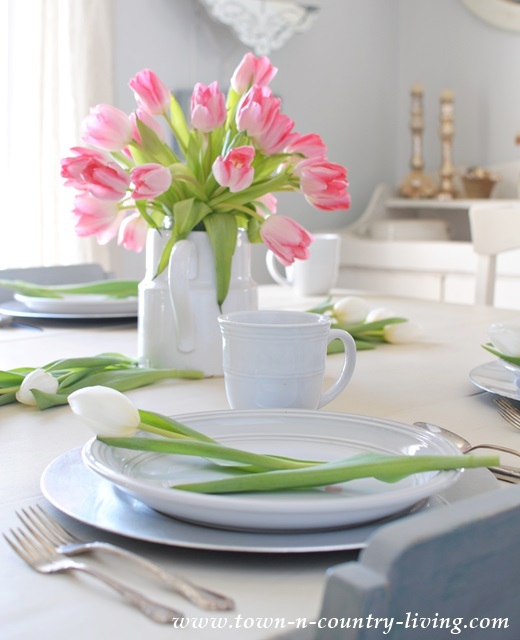 Pink tulips drooping softly create a pretty spring focal point on my farmhouse dining table. I wish tulips lasted longer, both indoors and out. Lilacs signal the coming of spring and I can’t wait for the lilac bushes to bloom and release their amazing scent into the garden. 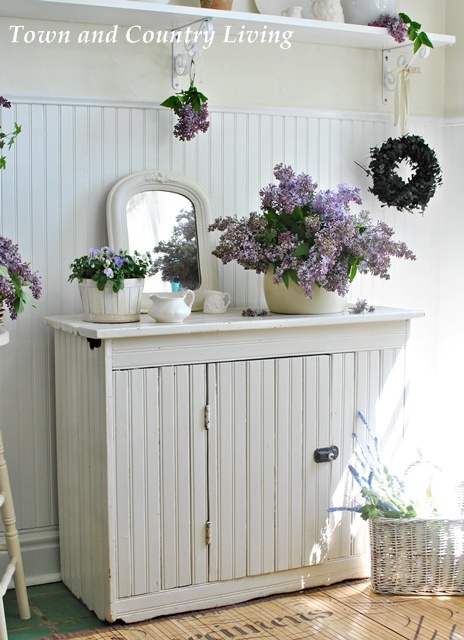 I love to open the windows and let the scent of lilacs waft inside. It’s fun to cut a big bunch and place them in a large enamel pot, without arranging them. Let them look a little wild! If you’re not comfortable arranging store bought or garden flowers, simply tuck a single stem rose into a vintage bottle all by itself. Wrap a ribbon or baker’s twine around the neck of the bottle for added embellishment. 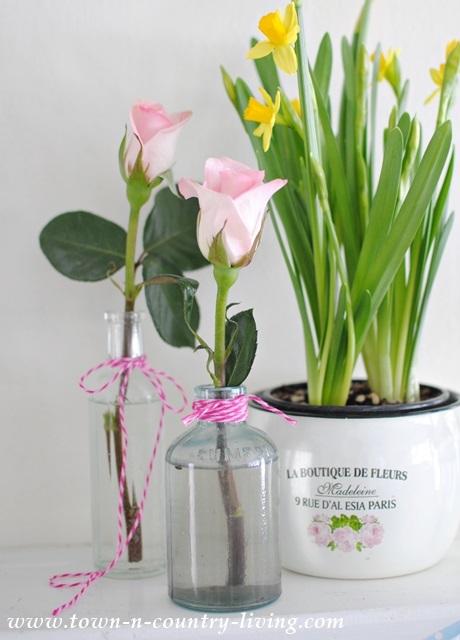 Another option for those who aren’t comfortable arranging flowers is to leave a potted flower in its plastic pot, and simply decorate the pot to spruce it up a bit. I left this hyacinth in its original plastic container but wrapped a book page around it and tied it in place with a piece of twine. If the pot is large, you’ll need to use 2 book pages to cover the entire pot. You could also wrap a piece of fabric around the garden pot, too. 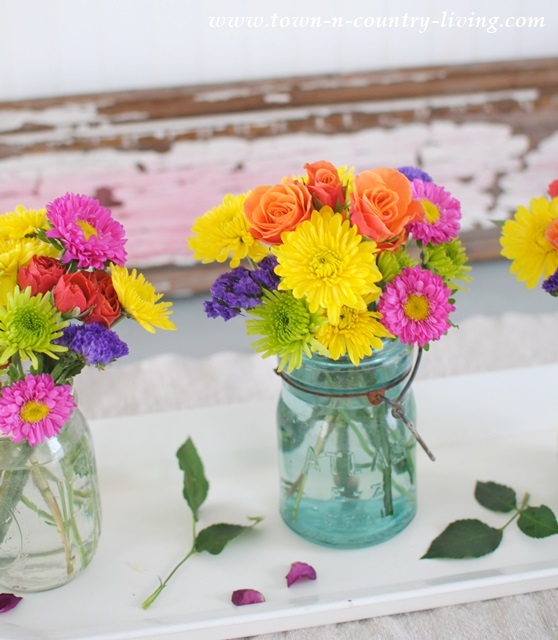 Inexpensive flowers from the grocery store have cottage charm when tucked into mason jars. I love the cheery colors of this floral mix and grouped 3 arrangements onto a single white platter. On occasion, our local grocery store has fabulous stems of sunflowers. I love tucking a single stem into a wine bottle. I think the green and yellow look so pretty together! At $1 apiece, they make a thrifty and pretty statement. You can find African violets at a good price too! Aren’t they cute lined up on the dining table? I added a vintage hankie under each one to create greater visual impact. I also placed the violets in terra cotta pots that I white washed. 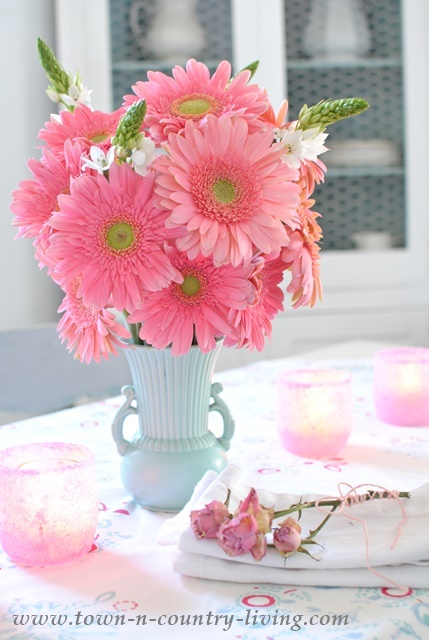 Pink Gerbera Daisies are one of my favorite flowers! 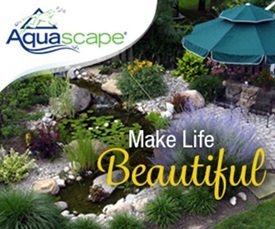 You can grow them in your garden or purchase them in the store. I love their happy faces! Finally, my heart always sings when I see a haphazard bouquet of wildflowers. These were picked from alongside a country road. I didn’t arrange these at all! I simply tucked them into an enamelware pitcher right after picking them. 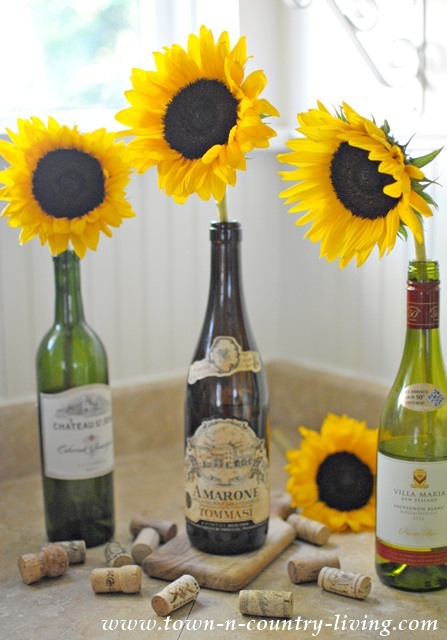 What type of flower arrangements do you like best? There’s still time to enter the Paint-a-Pillow kit giveaway!! They’re all beautiful!! I buy a fresh bunch every week. I miss fresh flowers! Thank you for the gorgeous photos – unfortunately, until Max gets older, fresh flowers are impossible here! I love fresh flowers and green plants. 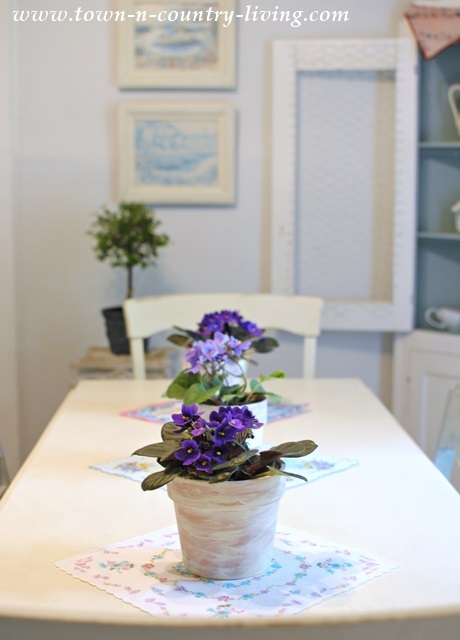 As soon as I saw the African Violets sitting on your dining table I knew you should pick some up for myself today. Thanks for the inspiration. Just a little bit of spring for my table. Such beautiful photos, the flowers against your white background are spectacular. My husband “buys flowers for me ” every week. 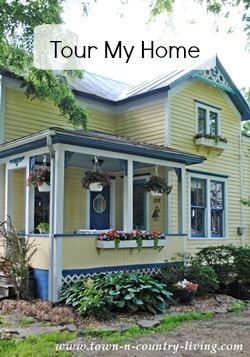 Now before you go all gooey….I use his CC to buy groceries every week and pick up flowers too. When he opens trunk to unload groceries ( yes he does do that) he always says ” what flowers did I buy you this week?” In fact I am off to grocery store now…I wonder what flowers he will buy today? Those Pink Gerbers make my heart swoon! You are so gifted! Thanks for sharing with us! 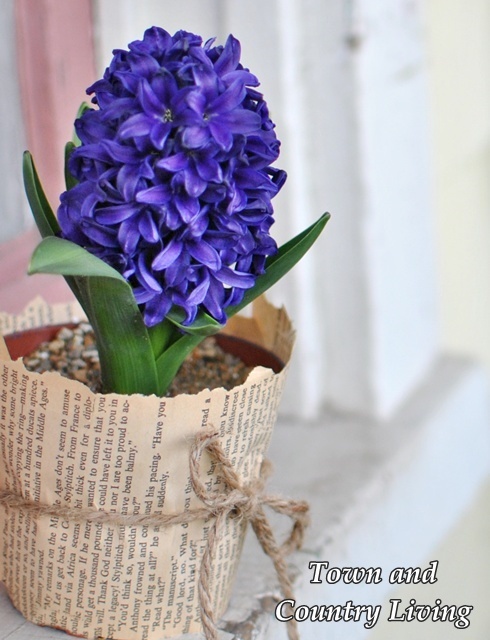 I like the paper around the hyacinth…….and with the fabric it’s lovely. I love all of these flower arrangements! You definitely have a way with flowers, Jennifer. 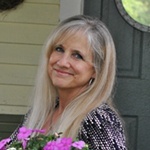 Your pictures are so gorgeous and all of your arrangements are beautiful! They are ALL so pretty! I love how you tore paper and placed it around the flower pot!